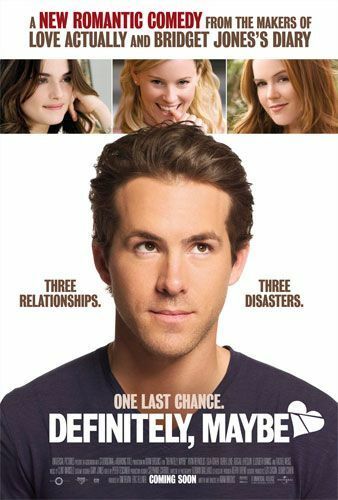 I ventured out to see Definitely, Maybe on Valentine’s night. I was originally disinterested in seeing this movie based on the previews. However, upon learning that screenwriter Adam Brooks had penned a couple of movies I’d liked (French Kiss and Wimbledon) as well as that it comes from the producers of such fare as Love Actually and Notting Hill, coupled with the fact that it seemed like appropriate Valentine’s fare, I decided to give it a shot. And I was very pleasantly surprised. First off, the opening credits to this film are possibly my favorite opening credits ever. From the main character’s quirky near-collision with the bus to the entrance into a school in pandemonium, they just worked. Additionally, seeing time progress through the ’90s provides some good laughs. My particular favorite comes when Reynolds as Will, who had worked so hard in ’92 to get Bill Clinton elected, tosses a carton full of Chinese food at his TV as Clinton asks for a definition of the word “is.” Between the gargantuan blocks called “cellular” phones and the excruciatingly low-speed dial-up internet, it was hard not to feel a little nostalgic. Ah, the ’90s. Good times. As is normal for the rom-com genre, a few parts of the movie felt a little forced. I won’t give away the ending, but I will say that I might have written it a little differently. However, it’s hard to offer up criticism of a movie that’s atypically pleasant and unique in an ocean of formulaic and brainless rom-coms that rely on star power instead of story (27 Dresses, I’m looking at you).